Playing games on the iPad or laptop may be convenient. But the perks of digital entertainment won’t come close to the benefits of playing outside. Riding a bicycle, running with friends, and playing baseball do more than just help little tots break a sweat. Outdoor play also helps kids stay physically and mentally fit. Here are all the reasons you need to convince you and your kids to spend more time and have more fun outside! Children (and even adults) need vitamin D. It helps bones grow, develop properly and stay strong. Children can get small amounts of vitamin D from food and supplements. However, diet alone doesn’t provide the adequate supply of vitamin D recommended by the American Association of Pediatrics. Kids need sunlight on their skin so the body can make vitamin D, and they get about 80% of it this way. Severe vitamin D deficiency can cause rickets, delayed motor development, muscle weakness, aches and pains, and fractures. Vitamin D is also essential during pregnancy to prevent neonatal hypocalcemia in children. So let your kids play under the sun even for just a few minutes — without sunscreen. Sunscreens are not only effective in shielding your child’s skin but will also block the vitamin from being absorbed. Just make sure the kids don’t get sunburnt. Often, the world of children seems all fun and games. Unlike adults, they don’t have to worry about keeping their jobs or paying utility bills. Nevertheless, even young children can experience stress. Separation from parents during preschool can cause anxiety. Not to mention they have to deal with academic and social pressures as they grow older. Just like grown-ups, little tots can use some stress relief, too. Outdoor play can help kids stave off their stress. There’s even a study about the positive effects green schoolyards have on children with stress. If anything, any outdoor space where children can play is an excellent way for them to escape from life’s daily routine. Stepping away from the confines of a homes frees and stimulates the imagination of children, enhancing their creativity in the process. 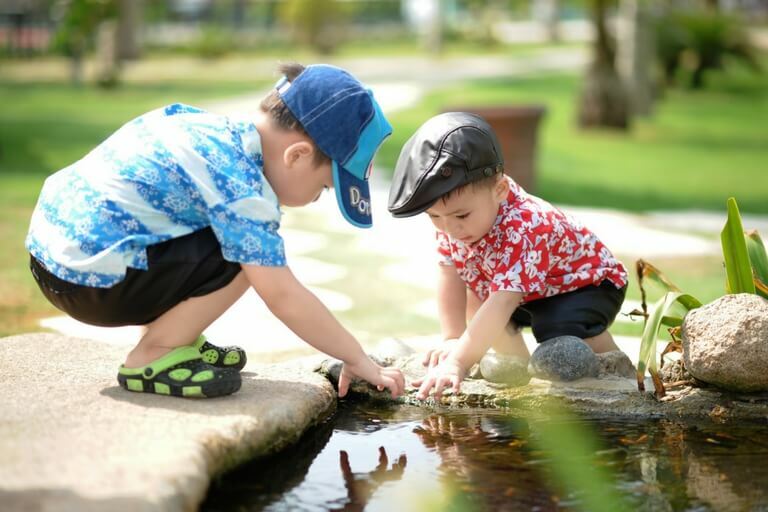 Outdoor play has also been shown to sharpen one’s focus in the classroom while preparing them prepared for more learning. Helping kids with ADHD stay calm and attentive is also one of the benefits of playing outside. Even better, the latter also improves their problem-solving skills which is something that they need for when they grow up. Even a simple activity like using a slide has its fair share of perks. For starters, a child get better at assessing risks and be able to make a wise decision to go down the slide or not. It also pushes them to go beyond their boundaries while gaining confidence in doing things on their own. The outdoors is a place where kids will meet and socialize with other kids. Going out of their comfort zones in order join other kids who are playing is perhaps, the first thing that they’ll learn. Outdoor play also teaches them independence since they’ll have to interact with children under indirect adult supervision. Working or playing in groups will teach them how to share (ex: food and toys) and cooperate with the people around them. If things don’t go smoothly and they end up in a dispute, kids get the opportunity to hone their negotiation skills. At the same time, a sense of camaraderie is established in them. he way that a child uses his eyes may also affect the progression of myopia. You might be wondering how playing outside is connected to this condition in kids. Well, the American Academy of Ophthalmology has found out that kids who play outside are less likely to develop nearsightedness. Furthermore, a child’s chances of developing myopia decreases by 2% for each additional hour spent outdoors, per week. Alarmingly, the number of children and adolescents affected by obesity has more than tripled since the 1970s. The short and long-term effects of obesity on the physical, social, and emotional health of children are a reason for alarm among parents. Many kids don’t get enough physical activities anymore. Consuming more energy from foods and beverages than what their bodies use for functioning, growth, and physical activity leads to extra weight gain over time. To make things worse, this can lead to other health risks as they grow older. One way to fight obesity in kids is by letting them play outside. Instead of just sitting in front of their computers or the television, encourage them to go explore the outside world. Running, jumping, swimming, climbing, dancing, etc. — all of these activities are forms of exercises. Not only that, but it will also strengthen their bodies and immune systems. Still, you have to remember that kids are kids. Never forget to keep an eye on them as you let them go out and play on their own. Accidents and injuries are inevitable during childhood but keeping them to a minimum if not avoiding them is ideal. There’s a lot of outdoor play ideas that you can let your kids try. But before you do, make sure to keep them safe. Here are things that you need to do and remember when you let your kid play outside. Never leave children alone outside. You can let them do their thing but always keep a close watch. For children that are older, teach them not to play near the street. Should toys roll into the street or driveway, tell them to ask help from you or an adult (someone they know) that’s nearby. Tell them not to speak to strangers no matter how friendly they look. If one approaches them, they should run away or go back inside the house. Check the outdoor play area for possible hazards like trash, sharp branches, tools, lawn equipment, and animal feces. Check that the outdoor area is fenced especially if it’s near a street, parking lot, or railroad track. Ensure that babies are secured tightly in their strollers. Teach old children the habit of wearing helmets and protective equipment when using bicycles, skateboards, roller skates, and ride-on toys. Avoid areas where insects congregate such as stagnant pools of water, uncovered foods, and gardens where flowers are in bloom to avoid insect bites. Apply insect spray if necessary. Although it’s mentioned above to let kids play without sunscreen for a few minutes, slather it on afterward. For kids who have very sensitive skin conditions, it’s a must to have sunscreens applied on their skins. Dress them appropriately based on the weather. Always have a supply of first aid kit handy for when something happens. Keep them hydrated and well-fed. What Are The Best Car Seat For 2 Year Old? What Are The Best Car Seat for 4 Year Old?